Recently, the American people have witnessed a rash of lawsuits targeting energy companies for their alleged role in causing climate change. As the National Association of Manufacturers has revealed, as part of its “Manufacturers' Accountability Project,” these lawsuits are fueled (as it were) by massive lawyers' fees. For example, a contract between trial lawyers and the city of San Francisco revealed that the plaintiffs firm would receive a 23.5 percent payday in the case of a favorable judgment, which could translate into millions of dollars in profits for trial lawyers. Democratic-led cities, counties, and state governments are suing these energy companies to make them pay for what they claim are the anticipated ill-effects of climate change, which would not exist, they say, if these evil corporations were not selling energy based on fossil fuels. The weaknesses of this argument, legally and logically, are apparent. Why would companies that sell energy be held liable for climate change, when consumers are not? Why are these “blue” municipalities and states only suing American companies, when, say, Russian, or Saudi, or Chinese carbon is just as, well, carbonized? Why are these jurisdictions not suing themselves, since they emit plenty of carbon on their own? Most importantly, how can one assess how much adverse weather is the fault of “climate change,” and how much would be occurring naturally? The idea that one can assign legal liability in such cases is frankly laughable, and fortunately no court has yet ruled in favor of such claims. The purpose of these lawsuits, however, may not be to win giant cash settlements. It may be instead to shame and intimidate energy companies. In other words, these lawsuits are mostly PR, but unfortunately that does not make them any less dangerous to our economy and our way of life. But, for the sake of argument, let us descend down the rabbit hole of climate change liability a little further. As you will see, responsibility for climate change may arguably be shouldered by the very people who are now hectoring America about “protecting the planet”. Let us return to the heady days of the 1950s, 60s, and 70s, when various “space age” technological advances seemed to hold great promise. Among the most exciting of these developments was the use of nuclear power to create electricity. Governments around the world were giddy with the prospects for creating an endless, cheap, flexible new source of power. President John F. Kennedy was on hand in 1963 at one plant opening, heralding our country's role as a leader in the peaceful exploitation of nuclear energy, and looking forward to a time when nuclear plants would provide half of the electricity that Americans used. As a result, in the ensuing years, nuclear plants were built at a breakneck pace, and nuclear energy began to blossom, offering serious competition to fossil fuels. And then came the environmentalists. 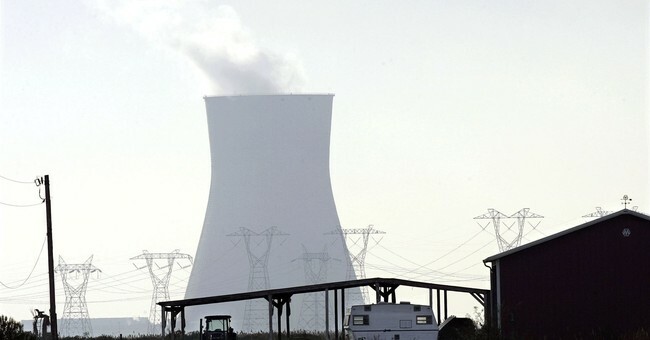 Citing concerns about the toxicity and long half-life of nuclear waste, and about the possibility of “meltdowns”, the rising environmental movement made opposition to nuclear power a litmus test for being “earth-friendly”. In 1979, an accident at the Three Mile Island nuclear plant in Pennsylvania, which harmed neither the environment nor any human being, was spun by environmentalists into a harbinger of nuclear-fueled catastrophe. A massive propaganda campaign against nuclear energy ensued, in which Jane Fonda's film The China Syndrome figured prominently, which led in turn to a flood of lawsuits as well as political pressure to suspend the construction of new nuclear plants. Plant construction duly ground to a halt, and, from the late 1970s to today, no new nuclear facilities have been approved in the United States. For our purposes, though, the bigger point is this: nuclear power does not create carbon emissions of any kind. Instead, it produces small quantities of nuclear waste, which are relatively easy to store. In torpedoing the nuclear energy industry, therefore, liberals and environmentalists destroyed the only viable alternative to our civilization's dependence on fossil fuels for energy production. What does all this mean? First, it means that the environmental movement is not wholly based on “reason” and “science,” as it claims. It can also be based on group think, NIMBYism, and raw emotion. This blinkered outlook can cause environmentalists to support causes that, in the final analysis, prove counterproductive to their own ends. Second, we can conclude that, if one wishes to assign blame for the problem of climate change, there is plenty to go around. One could assign blame only to energy producers, yes, and this would be convenient for liberals. The truth, however, is that there are equally valid reasons to blame humans, who, as energy consumers, are responsible for emissions. As we have seen, a strong case can also be made that environmentalists and liberals are the real problem, due to their demonization of nuclear power. Perhaps, therefore, Democratic municipalities and states suing energy companies for causing climate change might wish to revise their strategy. Instead of targeting ExxonMobil, or Chevron, or Shell, why not sue the real climate culprits: Jane Fonda, Ralph Nader, Jerry Brown, Greenpeace, etc.? Or, better yet, call off the lawyers altogether, stop vilifying people who think differently, and concentrate on finding workable solutions. That's an approach to climate change we can all live with.